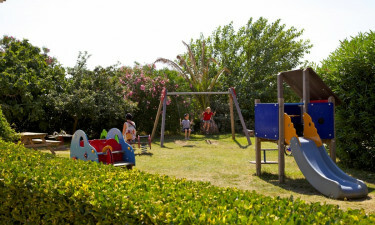 Les Jardins d’Elsa is the ideal location for a family holiday in the Mediterranean sunshine. The peaceful, friendly atmosphere of this luxury camping site makes it especially popular with families with young children. 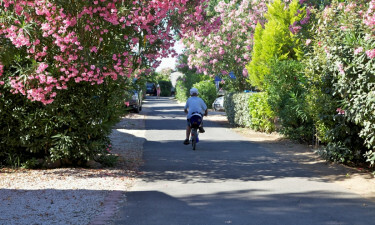 Les Jardins d’Elsa offers family-orientated luxury camping, located just a 15-minute stroll (3 minutes by car) from the white sandy beaches and natural lagoons of Vias, within easy reach of Europark. On site, you will find everything you need for a stress-free camping holiday, including mobile home quarters, a pool, restaurant and shops. Why choose a camping holiday at Les Jardins d’Elsa? Camping Les Jardins d’Elsa features a small outdoor pool with sun loungers. It is securely enclosed so that young children can play around the campsite in safety. During July and August, the kid’s club every morning keeps the little ones entertained with a varied programme of activities where they can make new friends. A 15-minute walk brings you to the beach at Vias, a crescent of soft white sand. Here, you will find an array of watersports including sailing, kayaking and windsurfing - or just relax at a beachside cafe. Older kids will be enchanted by the nearby Europark, one of the region’s best theme parks.